Kathy and I haven't run this stretch (we hope to one day), but we wanted to pass on information from others and provide you with a link to Todd Hoffman's North Idaho Paddling Site which has some very good information on this run. We mostly cover flatwater and easy rivers on this website, but since this stretch is just below some of the paddle trips that we do cover, we wanted to mention it. You hear differing opinions on the difficulty of this stretch, but we did want to clarify that it is a serious stretch of Class III to IV water and you don't want to take it lightly. Difficulty: Class III to IV. Levels: Paddlers use both the Moyie River (Eastport) Gage and a "stick" gage found at the Moyie Dam. If you do a search on the Internet, you'll see that paddlers will use both forms of reporting flows when they run the river. Northwest Whitewater Association has a chart which compares the stick gage to Eastport flows. In their analysis: 4-feet on the stick gage is approximately 2,500 cfs. while 6-feet is about 4,500 cfs (which is high and fast). Cautious river running levels are in the 500 to 2,500 cfs range (source1, source2). These same sources say that the Eileen Dam rapid which is the crux of the run becomes considerably more difficult above 2,000 cfs. This video shows a cataraft run of the dam at 1,280 cfs. Hole in the Wall rapid below the dam is also shown in the video and is clearly kicking at that level. Experienced kayakers reporting on the American Whitewater site push things a bit higher, saying that 3,000 cfs is good from expert kayaking standpoint, but agree that Eileen Dam is more manageable at lower flows. Getting to the Take-out. Moyie Springs Reservoir. From Bonners Ferry, take US 2 to Moyie Springs. You'll need to turn off of US 2 and go into Moyie Springs in order to reach Canyon View Road which leads to the reservoir. Drive upriver to Moyie Dam, and .2 mile past the dam, you'll find an area which is used by rafters and kayakers to take-off the river. Getting to the Put-in. Meadow Creek Campground. From Moyie Springs, drive back toward Bonners Ferry on US 2. At approximately 3.5 miles from Moyie Springs, take a right on the Meadow Creek Road (also marked as road 34). Stay on the Meadow Creek Road. In roughly 11 miles from US 2, you'll cross over railroad tracks and come to the Moyie River Road. Take a right and go .3 miles to the Meadow Creek Campground. The Trip. As we mentioned above, we'll let others more qualified describe this stretch of the river. 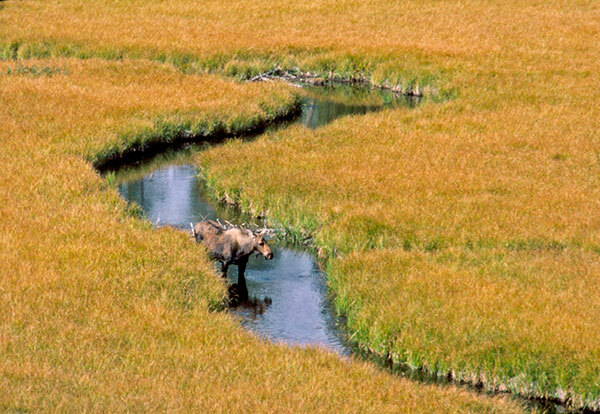 Todd Hoffman's North Idaho Paddling Site has an excellent description of the run. Greg and Renee Rouse also have a write-up of the run on their blog. 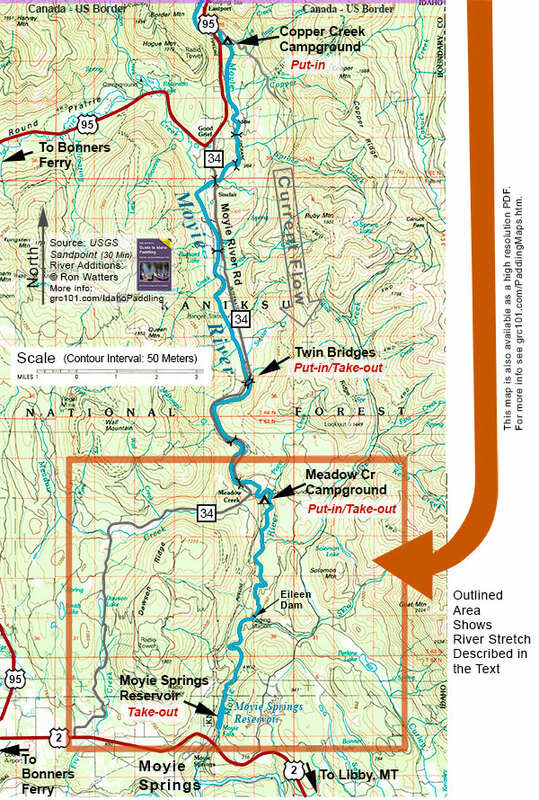 Since we hope to paddle it some day, we did put together map of the river (using 7.5 minute topo maps) that might be helpful if you are thinking about running it. On the map, we have marked access points and the location of the Eileen Dam. That's available: here. Eileen Dam has an interesting history behind it. According to Laura Roady, Outdoor Columnist for the Bonners Ferry Herald, it was built in the early 1920's to supply power to nearby mines. The name "Eileen" comes from a siding on the railroad line above the dam's location. In May, 1925, spring run-off pooled up behind the finished dam but not for long. The engineers had made a critical error of depending upon the structural integrity of the shale rock on the eastern side of the dam. With the pressure of the reservoir behind it, the river blew through the weaker side, sending a torrent of water downstream. Today's run through the far left channel is courtesy of that 1925 blow-out. Fortunately, the mine owners couldn't raise enough capital to re-build the dam and the lower canyon of the Moyie remains free flowing. Shuttle. Approximately 16 miles one-way.